Quite frankly I would be surprised if you’ve lived in OKC for awhile and had not heard the Medieval Fair of Norman. Granted this is not in OKC, but it’s the largest free-admission Medieval fair you’ll find in Oklahoma. This, I’m not going to lie, is like mecca cos-play for your average Society for Creative Anachronisms member, or SCA, and boy do they take their roles seriously. If you’re a photographer color abounds, as does light and shadow. What else is magical? 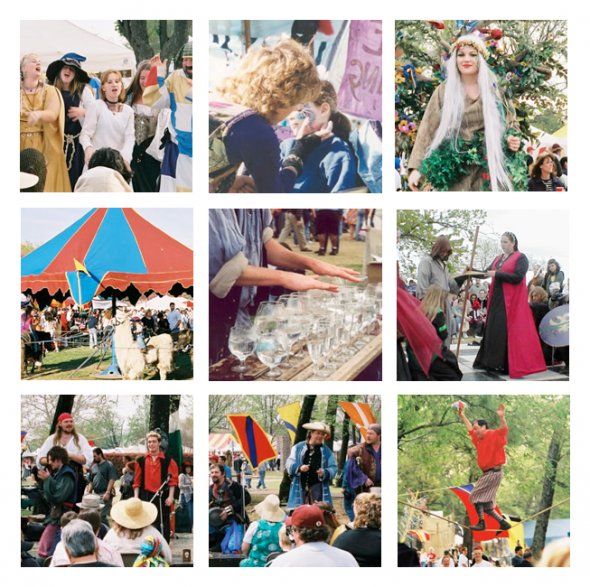 Only “Ye Old Everything.” From homemade root beer served to you in dark indigo glasses to weird anachronistic things you never knew you needed, Norman’s massive Medieval Fair is an annual treat for anyone with a taste for George RR Martin-esque fashions. Will you see copious amounts of cleavage? Oh, most certainly. The ladies don’t mess around with their bodices. Alternatively, the men often don hats and swords and things. Sprinkled amid the bar wenches and rangers, are your fairies, mermaids, and walking lady trees. Camels and ponies are options for exploring too. And then there are the belly dancers, aerial acrobats, and royal courts with their jousts and processions, to say nothing of the wandering minstrels and jesters. So if your tastes run towards the fairylands of old, think “Last Unicorn” finally notices Mr. “Dungeons and Dragons” in their shared class about the Middle Ages. Smitten, and brought together by their mutual appreciation for this time in history, “Dungeons and Dragons” asks “Last Unicorn ” to walk with him to their literature class covering the same era of courtly love and romance, but without the inconvenience of the Black Plague to cast an ugly shadow over this blossoming date…yeah, if that’s you, then right here is your event. It’s also pretty darn family and pet friendly too. Fair hours run from 1o a.m. to 7 p.m. Dates run from April 5, 6, and 7th. Need directions? Here’s a “Ye Olden Times Map“. Other notes: check their Facebook or website for more info. Tagged beer, Black Plague, Facebook, Last Unicorn, Medieval Fair, Middle Ages, OKC, options, SCA, weird. Bookmark the permalink.